A variety of delicious pork roasts, including recipes using boneless and bone-in pork loin, pork rib roast, crown roast, pork shoulder, and more. This stovetop braised pork loin is easy to prepare, and orange juice and garlic make it flavorful. Serve this pork loin with rice or noodles for a tasty family meal. This is an easy and elegant meal, special enough for a Sunday dinner or holiday meal. Add hot baked rolls, salad, and your favorite steamed vegetables for a perfect family meal. 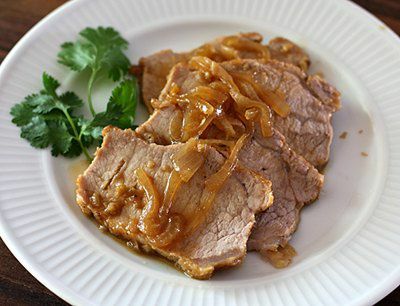 This is an easy and flavorful pork roast to prepare for a special dinner or everyday meal. This bacon-wrapped pork loin is finished with a delicious brown sugar glaze. Serve this flavorful roast with mashed potatoes, corn, and a tossed salad. Serve this flavorful glazed pork loin with mashed potatoes and your favorite side vegetable for a delicious everyday meal or weekend dinner. A crown roast or pork recipe with diced apples, herbs, and optional dried cranberries. Your butcher might have the frills for the bone tips, or you might be able to find them in a kitchen or housewares store. This pulled pork recipe is an oven barbecued pork roast, shredded then heated with barbecue sauce, onions, and seasonings. A great dish for a party or big meal, or freeze the pulled pork in batches. Keep it warm in the crock pot for a party. This roasted pork loin is seasoned then glazed with a mixture of brown sugar, mustard, and balsamic vinegar. Serve this delicious pork roast with mashed potatoes and your favorite vegetable side dishes.